“Makes you feel kind of small, doesn’t it?” I asked my friend and frequent hiking companion as we topped a ridge with sweeping views of the Granite Mountain basin. It wasn’t just the breadth of the view that caused us to catch our collective breaths, however. Spread before us along the Upper Pasture Loop Trail was stark evidence of the devastating Doce Fire that had swept through the area near Prescott, Arizona in June 2013. 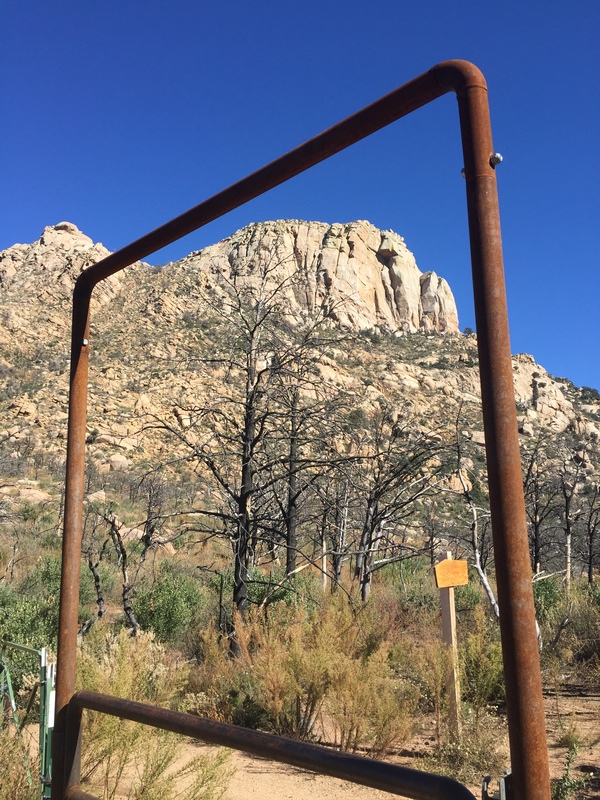 The hike, which starts at Contreras Ranch Road west of Prescott, cuts directly through the area hardest hit in the fire that engulfed more than 6,500 acres of the 9,800-acre Granite Mountain Wilderness Area. 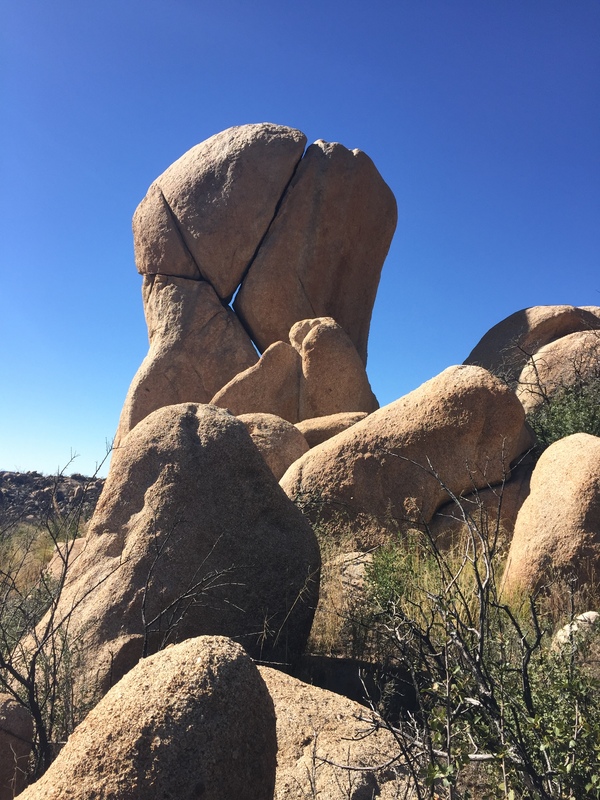 Along with showing off the stunning granite rock formations and the gigantic Granite Mountain looming in the distance, the hike also is a case study in human effects on nature. 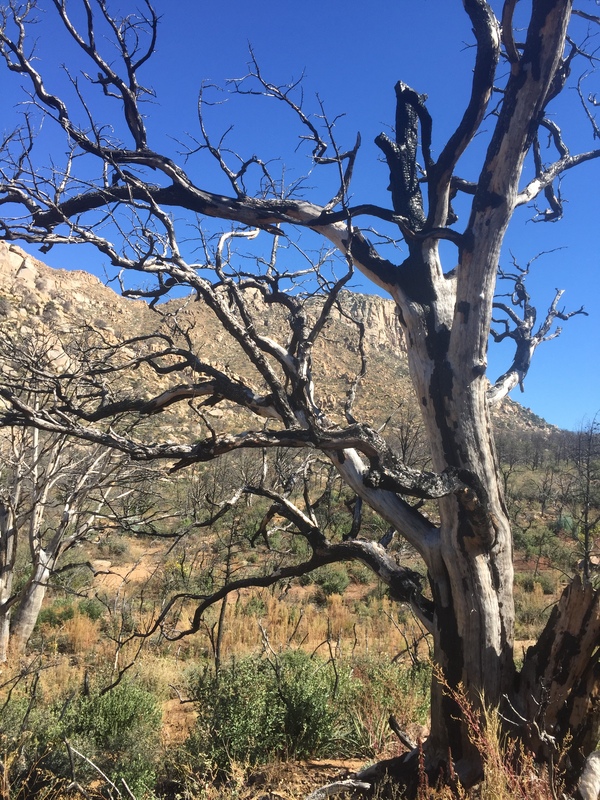 It was obvious from our walk – now more than two years later – that the human-caused Doce Fire had done irreparable damage. 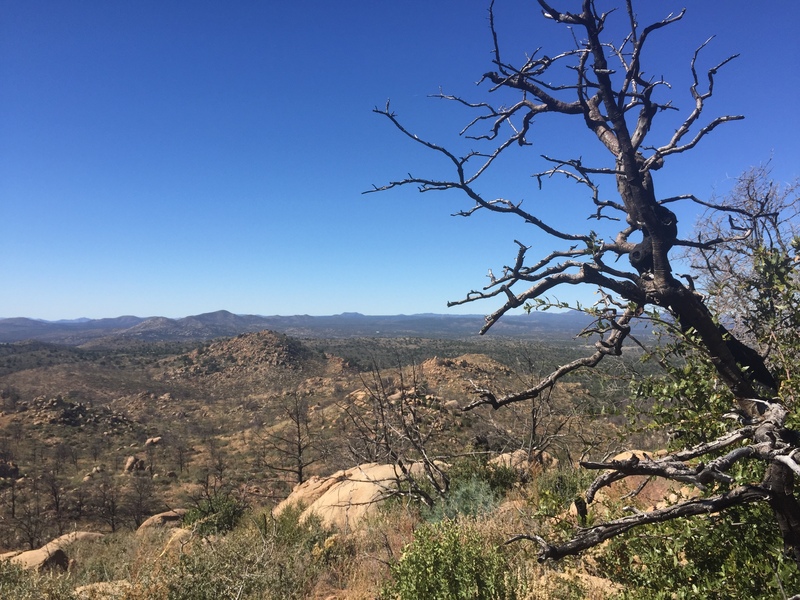 Virtually as far as the eye could see were blackened tree trunks, scorched cacti, and hills barren of the area’s typical chaparral-type brush and shrubs. That is not to say it wasn’t beautiful. We marveled over and over at the black-and-white splotched branches reaching high into the deep blue sky. And the pink-tinted rock formations – without the softening chaparral covering – now stand out in even sharper contrast. But it certainly wasn’t beautiful in the way we remembered it. My impressions of a hike we had taken through the area about five years ago were of a lush route with water rushing alongside the trail from a recent winter storm. I think we both were taken aback at the complete transformation on this hike. Any trace of tree cover is now gone, opening up the trail to direct sunlight and endless views. The hike is also memorable for another somber reminder. 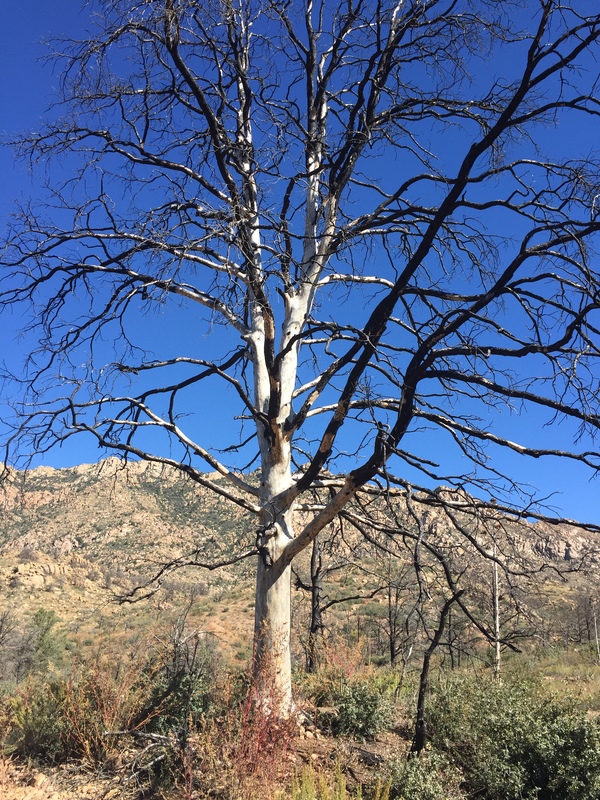 About two miles in, if you take a short jaunt off the main trail, you will come to a giant alligator juniper tree standing in the midst of a forest of charred trees. Next to the juniper is a large freestanding plaque that explains the tree’s sad history. 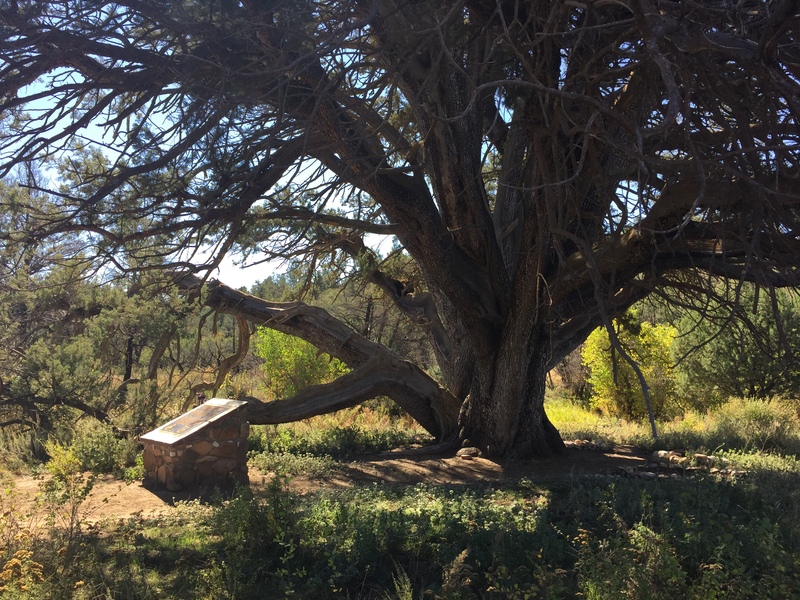 The inscription on the plaque explains that the juniper tree – designated a “champion,” as one of the oldest and largest of its kind – had been in danger when the Doce Fire raged in. Members of the local Granite Mountain Hotshot crew of elite firefighters were tasked with protecting the tree. 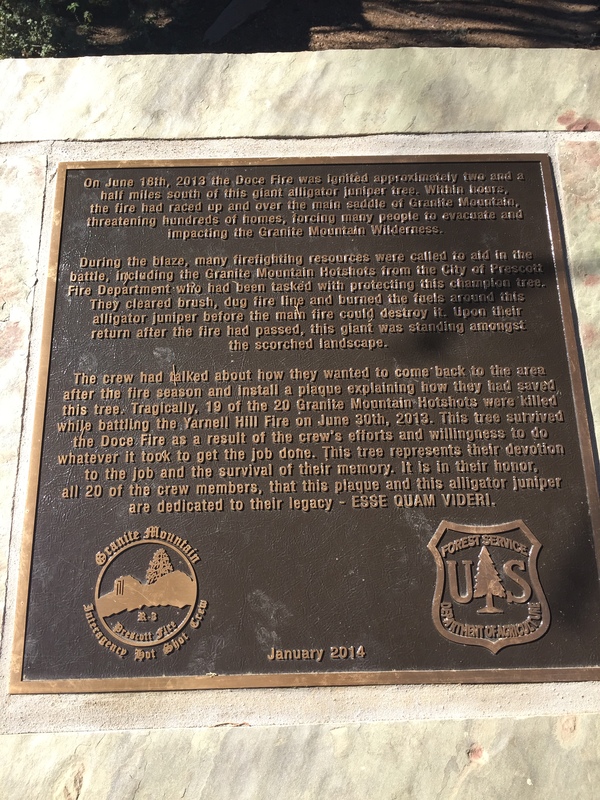 The young firefighters cleared brush, dug fire line and burned the fuels around the juniper before the main fire could destroy it, according to the plaque. “Upon their return after the fire had passed, this giant was standing amongst the scorched landscape,” the plaque reads. 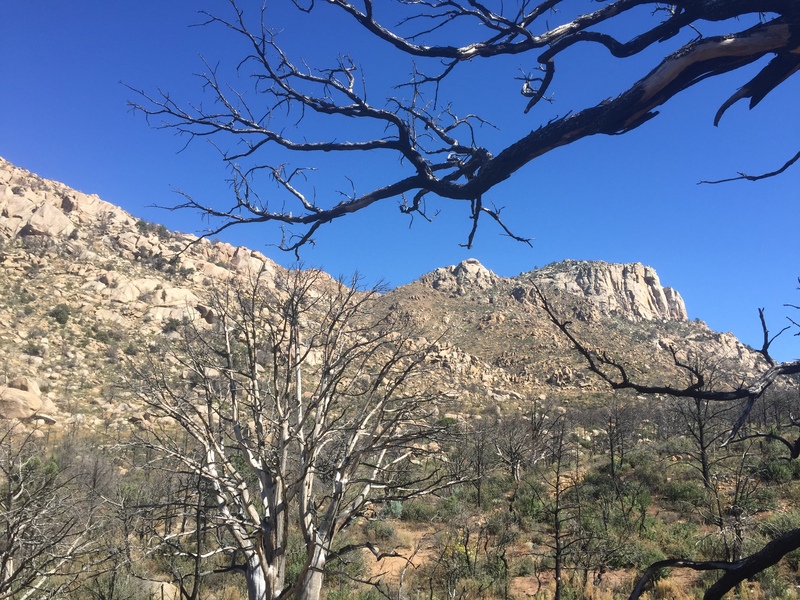 For many area residents, a hike to the tree is a way to show respect to the Granite Mountain Hotshots. 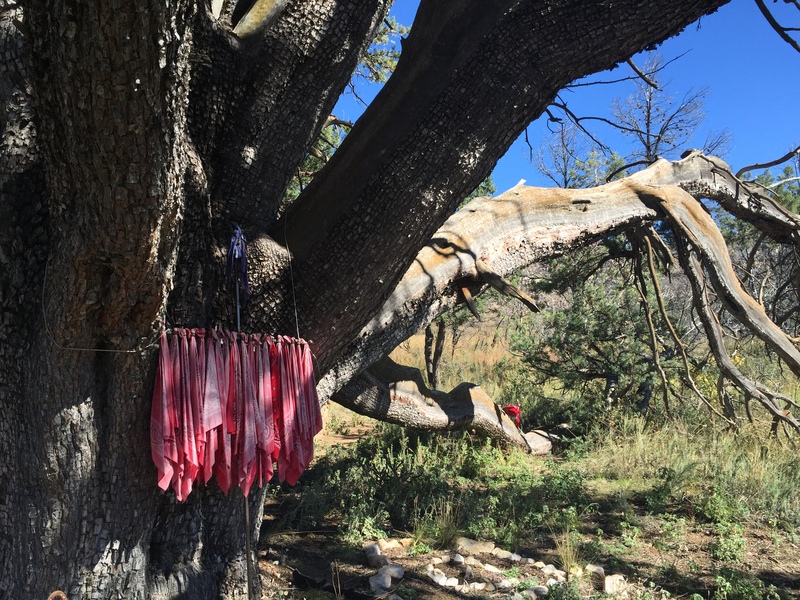 As we hiked there this past weekend, we passed a man who told us simply, “It’s still there, and it’s doing fine.” A number of remembrances have been left at the tree, including bandanas, heart-shaped formations fashioned from rocks, and a shining angel on a nearby hill. It definitely is a somber spot. 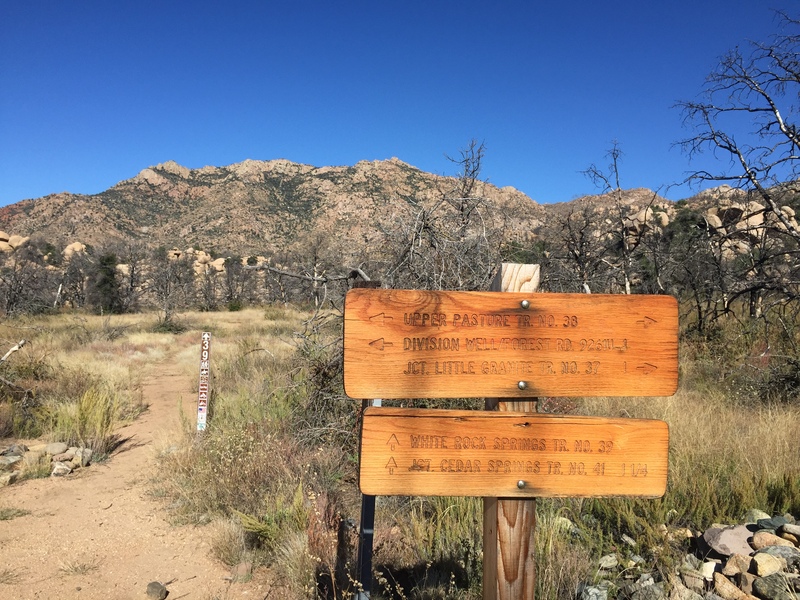 If you do the entire Upper Pasture Loop Trail, you will connect up with the Little Granite Mountain Trail, and Blair Pass – the junction that connects with the trail to the summit of Granite Mountain. 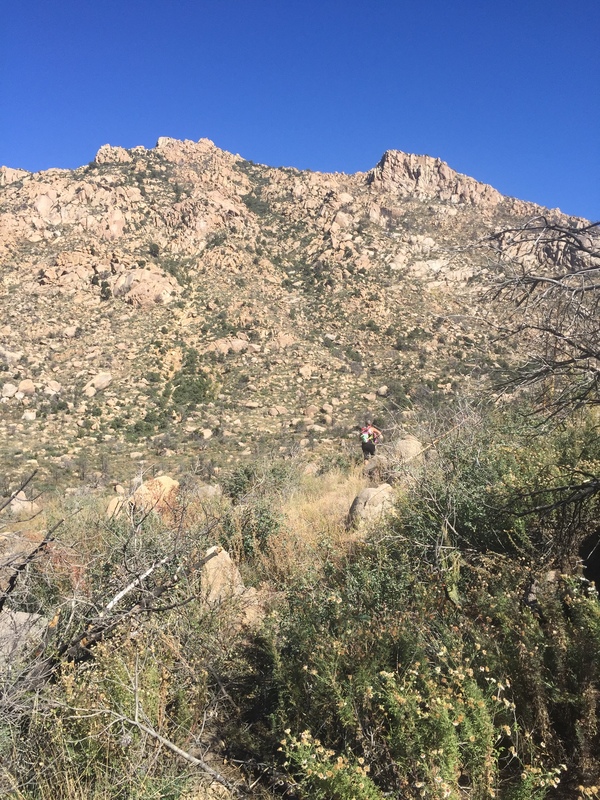 We continued on the loop to the White Rock Spring Trail (Trail 39), and back to the trailhead on Contreras Ranch Road – for about 8.3 miles total. Although forever changed, the route is worth hiking. It lets you walk in the line of fire and witness its effects first-hand. 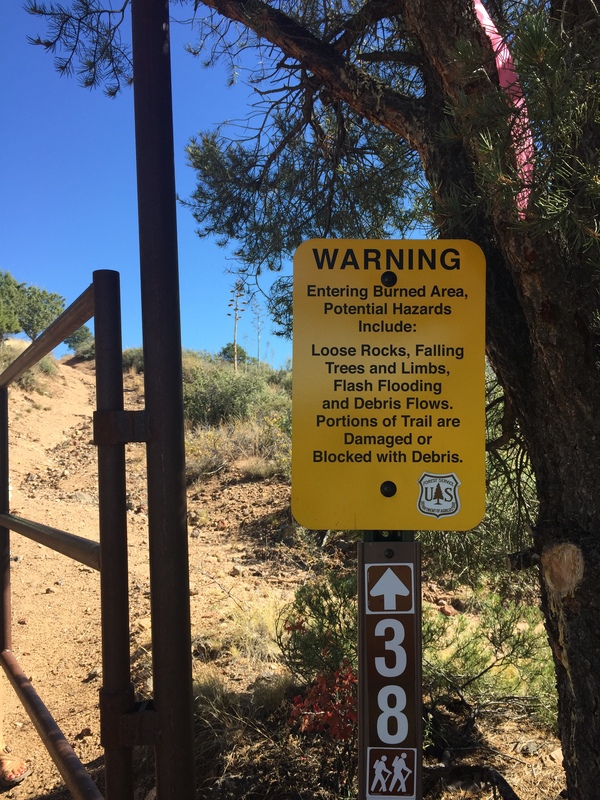 (Conteras Ranch Road (Forest Road 102A) is located off Iron Springs Road, about 8.4 miles west of Prescott’s Four-Points intersection of Willow Creek, Whipple/Montezuma, Miller Valley, and Iron Springs). 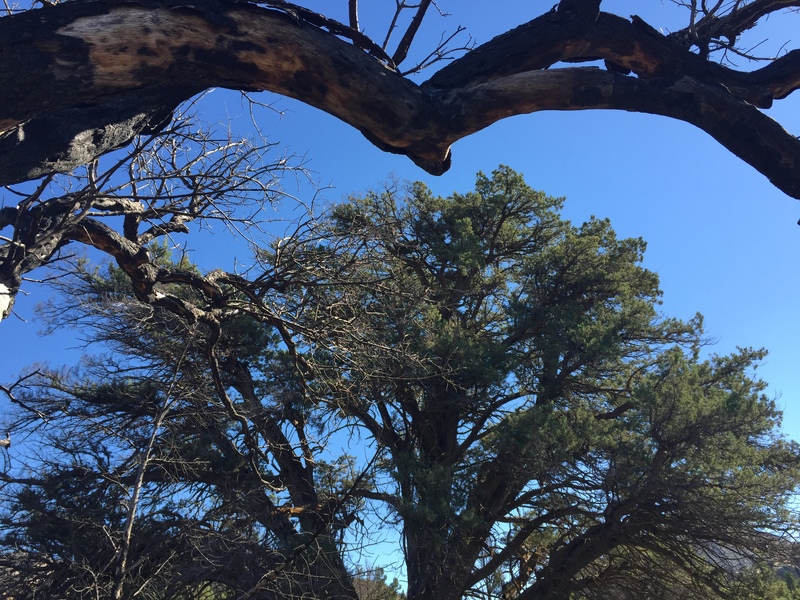 Thank you for sharing this story of the alligator juniper saved by the Granite Mountain Fire fighters. Hi Mave. I appreciate your message! I love that tree and the story behind it. It will always be a special spot for me. Thanks for reading. My friend and I were there yesterday, October 21, 2017. We hiked the loop from Blair pass on 39,38,and 37. Long but worthwhile. Made me appreciate how hard wildland firefighters work. Spectacular scenery in spite of the dead trees. Worth the effort. And seeing that juniper was amazing. I agree – It’s definitely worthwhile. It does sound like a long hike. I’m glad you got to see the juniper. It’s a special spot.